The portrait of Elvis Aaron Presley is titled "The King", and is the main artwork of the portrait exhibition 'A Tribute to the Music - Vol. 1', which can be seen at Art Gallery PS in Aarhus. - The exhibition is my personal tribute to some of the singers, musicians and composers I have listened to in my life. Music has always been a part of my life. It started in my early youth in the 60’s ... and with one of my very first singles with Elvis, Peter Simonsen tells. The portrait painting of Elvis Presley is for sale. 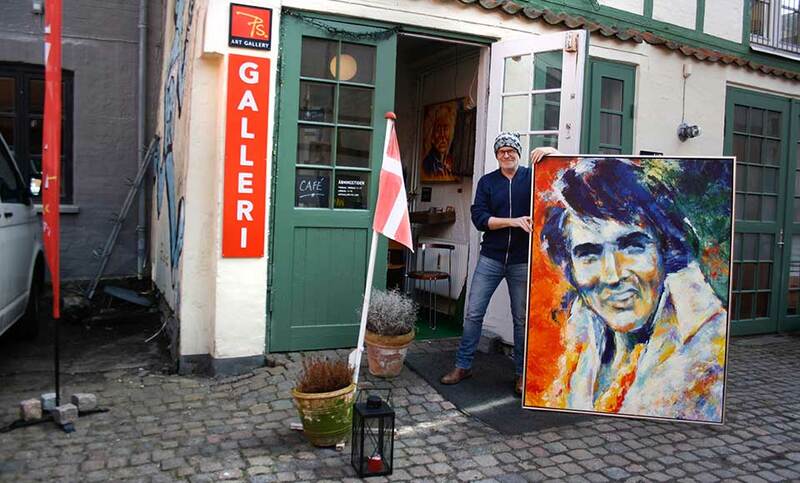 Portrait painting of Elvis Aaron Presley in acrylics by Danish portrait painter Peter Simonsen (PS). The painting is titled "The King". Size: 120 x 160 cm. Painted in 2017. 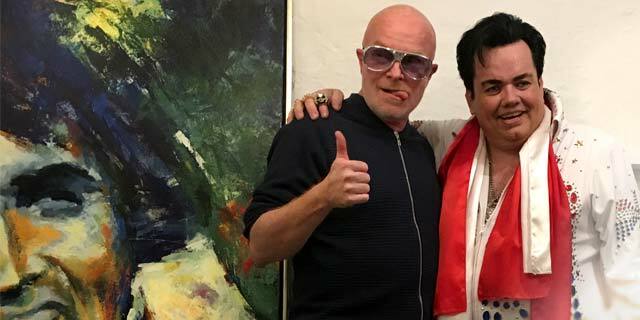 Danish portrait painter Peter Simonsen together with Mike Colin Andersen, one of Europe's best Elvis Presley impersonators. 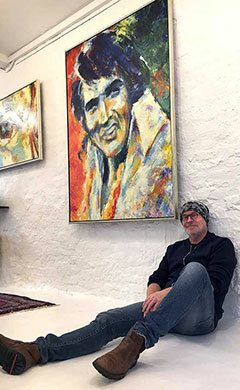 Danish portrait painter Peter Simonsen together with the portrait of Elvis Presley. 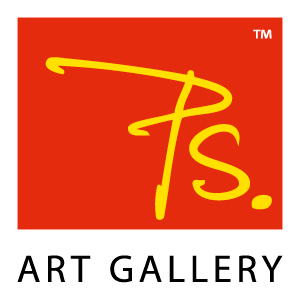 The painting is exhibited alongside other fan art portraits at Art Gallery PS. 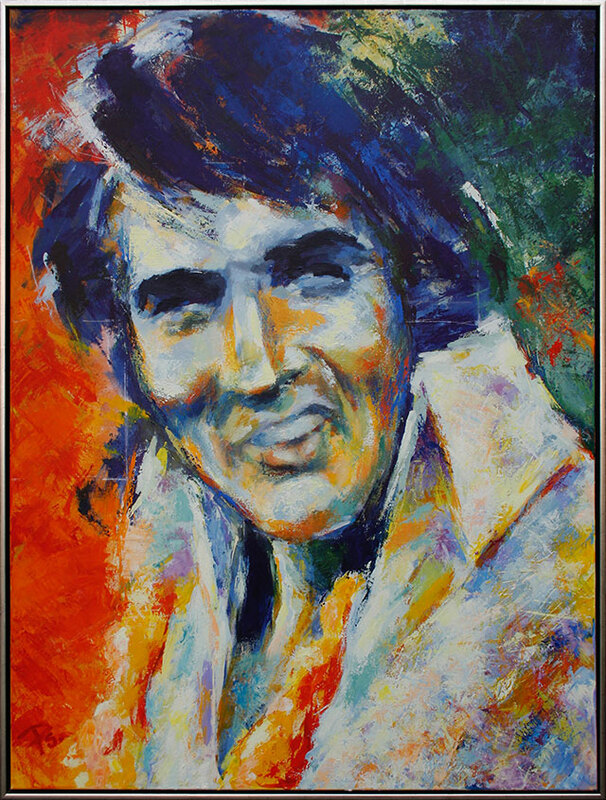 The original Elvis portrait titled 'The King' was inspired by the Aloha from Hawaii Via Satellite concert that was broadcast live via satellite on January 14, 1973. The show was estimated to have between 1 and 1.5 billion viewers worldwide. The artist was one of the many viewers. The Elvis portrait was painted on canvas using different acrylic painting techniques. In the beginning both wet and dry brushes were used. Most of the portrait painting was done using various palette knives. 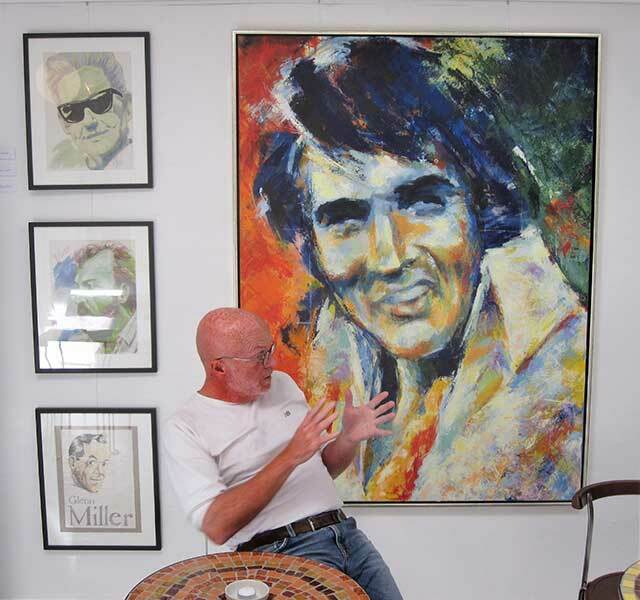 The exhibition's main artwork, the portrait of Elvis Presley, was revealed by Mike Colin Andersen, Europe's best Elvis Impersonator.